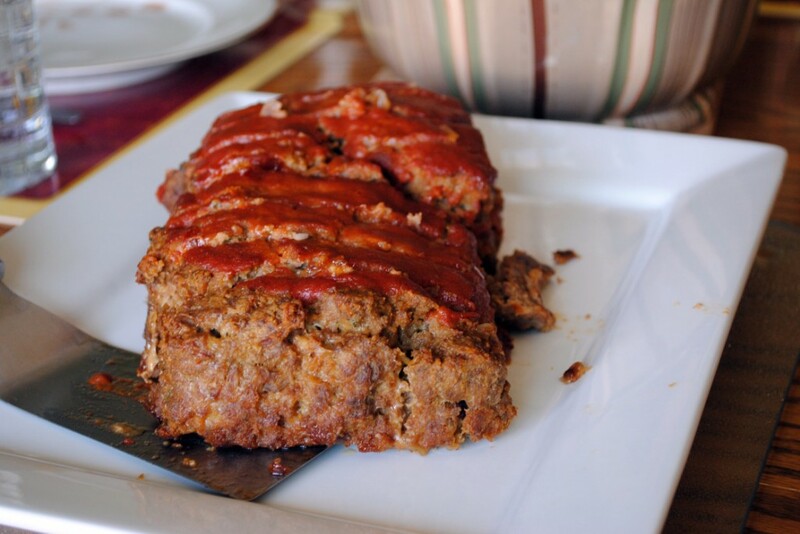 Admit it, you’ve had meat loaf at some point in your life. Ok maybe you didn’t immediately fall in love this American staple but like any red blooded American you liked it. Here’s a way to re-discover mom’s favorite go-to recipe…with a twist that just might get this back on your regular rotation. In a large bowl, combine all of the ingredients except the Heffys and mix well with your hands (we use gloves but hey thats the kind of guys we are); ensuring that all of the spices are mixed thoroughly. Pre heat the oven to 350 degrees and spray a loaf pan with cooking spray. Form the hamburger mixture into the pan and top with the ½ cup of Heffys All-Natural Original. Bake for 90 minutes, ensure that it is done by using a meat thermometer; should read 160 to 180. For a less spicy version; exclude the cayenne pepper and chili powder. Enjoy with the family or some friends. Summer time is the best time of the year in my opinion. There are so many events going on and with that comes some of the best food of the season. We just went camping this weekend and we were all exchanging foods with our friends. I decided to try a recipe that was something new for me and it turned out great! Just follow the steps below and get ready for a great BBQ meal! 1-½ cups HEFFYS All Natural Sweet Mesquite BBQ sauce. Cut slices of bacon in half. Cook bacon half way (should not be crisp). Combine Heffys Sweet Mesquite BBQ Sauce, lemon juice and garlic powder (pour half of mixture into separate bowl for use later). Dip shrimp into half of sauce to thoroughly coat. 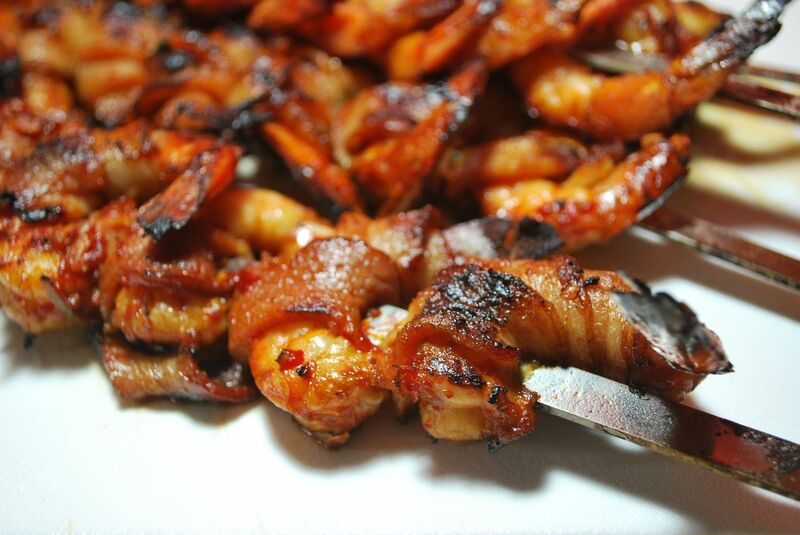 Wrap each piece of shrimp with ½ piece of bacon. Place on skewer (leave small space between pieces). Place on greased hot grill, basting with remaining sauce mixture. Grill for approximately 4 to 6 minutes (depending on size of shrimp). In a large bowl, combine all of the ingredients except the Heffys and mix well with your hands; ensuring that all of the spices are mixed thoroughly. Pre heat the oven to 350 degrees and spray a loaf pan with cooking spray. Form the hamburger mixture into the pan and top with the ½ cup of Heffys All Natural Original. Bake for 90 minutes, ensure that it is done by using a meat thermometer; should read > 160. For a less spicy version; exclude the cayenne pepper and chili powder. Fire up your grill and cook up your chicken and bacon. Lower your grill down to low and if you have a pizza stone, put it on your grill to get it heated up (if you don’t have a pizza stone you can just put your pizza directly on the grill but it is very easy to burn your crust that way…so, maybe ask for a pizza stone for your birthday Cut/break up your chicken and bacon into bite size pieces, Chiffonade the basil and cut the fresh mozzarella into 1/4 inch slices. Now it’s time to assemble your delicious pizza…place your crust on your stone and spread about half a cup of Heffys BBQ Sauce on top. Spread the chicken and bacon evenly over the crust then apply the fresh basil and then the mozzarella on top. Finally drizzle on the remaining Heffys BBQ Sauce and close the lid of your grill until your cheese is all melted. 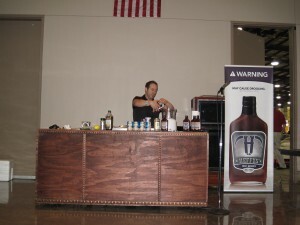 So it’s no surprise that they asked us to come cook something with Heffys at the cooking demonstrations. We sent our CEO, Mike Farag, over to the Royal to be one of the chefs’ presenting that day, he happened to be right before Hell’s Kitchen winner, Holli Ugalde. 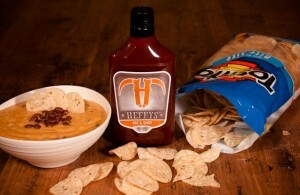 What did he make you ask….Heffys Rocket BBQ Hummus. Yeah that’s right. Hummus & BBQ. A match made in heaven, according to the over 100 people who watched eagerly as our boy combined all the elements most would never think to do. Sound good? Trust us….it’s ROCKET good. processor and blend for 20-30 seconds. 60 seconds or to your taste. Need a quick and delicious snack for watching the big game? 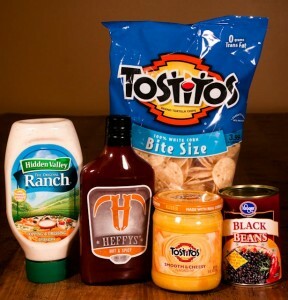 Mix the Heffys, Queso dip, Ranch dressing, and black beans together in a mixing bowl. DONE, it’s that easy. Grab the chips and enjoy! Would you like to try something a little different on the grill? Here is a great idea that will be a hit with the kids as well; grilled Heffys Meatball Pizza. * In a large bowl, combine the flour, yeast, sugar and salt. Add water and oil; mix until a soft dough forms. Turn onto a floured surface; knead until smooth and elastic, about 6 minutes. Cover and let stand for 15 minutes. * Meanwhile, cook the meatballs according to the directions on the package. Cut the meatballs in half and in a large bowl, combine with your favorite flavor of Heffys BBQ sauce and stir to coat. If a 1/2 cup of Heffys is not enough; feel free to use more! * Divide dough into fourths. Roll each portion into a 6 inch wide circle. Coat the grill rack with cooking spray before starting the grill. 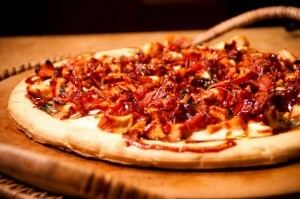 * Grill dough, covered, over medium heat for 1-2 minutes or until the crust is lightly browned. Remove from the grill and layer the grilled side of each pizza with meatball mixture, cheese and onions. Return pizzas to the grill and cover cooking 4-5 minutes or until the curst is lightly browned and cheese is melted. So quick and easy and very tasty! This info is brought to you by one of our partners The Firewood Guy whose products you can find at most of our retailers in Wichita, KS. HICKORY – The KING of woods!! Excellent for all red meats, pork, and poultry but be careful you don’t use too much. Hickory is one of those woods that you can over smoke with and the flavor can become TOO strong. So ramp up slowly until you find out how you like it. PECAN – Simply stated, pecan is “hickory lite”. Very subtle, sweet and mild. Goes with anything and I mean anything, it can even be used for baking. Truly a chef’s choice. MESQUITE – Tremendous, but don’t use too much! Flavors? BAM! Excellent for beef, chicken, fish, wild game. Burns very hot and works great for grilling to give that “flame kissed” taste. Smokers? Yes, but again be careful and ramp up slowly. APPLE – Mild, fruity and sweet taste. Good with poultry (skins will brown), fish, pork and even vegetables. CHERRY – Very similar to apple. Flavor large meats like ham or pork shoulder. Also good with fish, salmon and poultry. PEAR – Nice subtle fruity smoke flavor but not quite apple or cherry. Great with chicken, pork and all vegetables. MULBERRY – The most overlooked of the cooking woods. It is a fruit wood like apple, cherry and pear BUT it has the density and heating value of oak. The best of both worlds, use it for anything. Experiment and practice is the name of the game! You never know what you’ll like and don’t like until you try it, have fun! You are currently browsing the archives for the Recipes and Tips category.